GMT Eccentric Compensating Chuck with retractable jaws and face drive (PER) is suitable for machining forgings and black bars between centres in a single setup, (i.e.) no second operation necessary. This chuck is ideal to machine components centre to centre with great accuracy. A hydraulic cylinder actuates the retractable jaws and the jaws have an eccentric clamping drive. 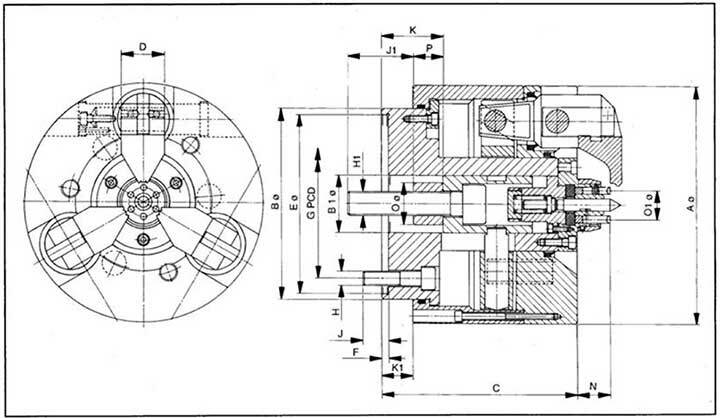 After machining operations are complete, the clamping jaws retracts without stopping the machine. The face driver transmits the torque through for driving the jaws. The gripped portion can now be finished with fine depth of cut. This ensures that the component is machined right upto the chuck face and the centre to centre machining of component is completed. The chuck body is of medium carbon steel. The levers and hinge pins are made from nickel chrome steel, case hardened and ground in all working surfaces. The hard jaws are made from low carbon steel, case hardened and ground. The design of the special jaws ensures clamping the component as close to the centre to avoid distortion of the component and to provide consistent gripping. Please visit us at https://gmtmachinetools.blogspot.in – a new blog dedicated to all GMT customers…interact with our technical experts.